The Botanical Garden area is mainly occupied by pyroclastic products and basaltic volcanic slag outside coming from the Lower Series of the first volcanic cycle (Series I) of the Miocene, in which the great volcanic buildings were created as shields forming the emerged part of Fuerteventura. These were later dismantled by water erosion, massive gravitational landslides and tectonic processes. In fact, La Lajita’s basaltic rocks are often heavily fragmented (joints), indicative of violent tectonic movements on past geological epochs. 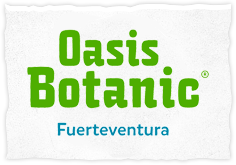 The strong fragmentation, with numerous cracks, promotes water infiltration and also the establishment of native plant species such as cactus and majorera’s sage, this last one specialist on penetrating with their deepest roots in cracks of basalt’s walls. The soils of the area are poorly developed, being mostly shallow calcimagnesic, shallow and very stony soils. Generally, from 30 to 50 cm deep and hard and unaltered rock outcrops. In many areas the soils present calcareous crusts with variable thickness. Cliff’s funds consist of gravel accumulation.